I am a fan of Doctor Who. To my friends and family who are not part of the whole Doctor Who world, I seem a bit mad and eccentric. To the people who inhabit the Whoniverse with all the love, fervour and passion of Doctor Who fandom, I’m probably a bit of an amateur. But I am passionate, and I write weekly episode reviews for a culture ‘zine blog . 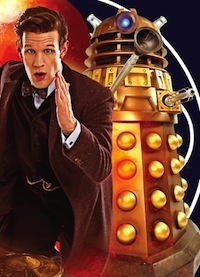 I’ve also done a couple of reviews of Doctor Who audio adventures for the extremely well-regarded BlogtorWho website. An honour indeed. As an occasional contributor to the BlogtorWho website, the Blogtor himself (Cameron K McEwan) sent me this book to review. The Dalek Generation is written by Doctor Who legend Nicholas Briggs, who among his many talents provides the voice of the Daleks and the Cybermen in the TV series. In a recent interview, Russell T Davies, the man who brought Doctor Who back to our TV screens in 2005, admitted that he wished he’d asked Briggs to write an episode when he, Davies, was the showrunner. And so as I read The Dalek Generation I wondered whether Davies’s faith in Briggs’s writing ability was justified. Well, yes and no, to be honest, although when I submitted my review to BlogtorWho, I did feel as though I’d shot Santa or something equally awful. I loved the way Briggs’s love of the show dripped from the pages of the book, but the story itself felt a bit saggy round the middle (hey, don’t we all! – Ed). The whole experience, though, was a really positive one and it’s a good thing for me to be trusted by someone I admire and respect to write something for a website that has, until quite recently, been run solely by him. It must have taken a big leap of faith for the Blogtor to trust me and a couple of others to write for his site, and one I hope I’ve done justice. Read my full review at the BlogtorWho website.